Melanie and Julia teamed up to co-author an article entitled “What No Longer Serves Us: Resisting Ableism and Anti-Judaism in New Testament Healing Narratives” published in the Journal of Feminist Studies in Religion. On May 16th, they will be joining WATER for a teleconference to discuss their article and their work together. Melanie S. Morrison is founder and Executive Director of Allies for Change. She is a seasoned anti-oppression educator, activist, author, and spiritual director. She works with individuals and organizations to better understand the connections between systemic oppressions. Melanie got her Masters from Yale Divinity School and her Ph.D. from the University of Groningen (Netherlands). Melanie served as Executive Director of The Leaven Center, a retreat and study center in Michigan. She also co-founded Doing Our Own Work, an intensive anti-racism program for white people. She is the author of numerous articles and three books including The Grace of Coming Home: Spirituality, Sexuality, and the Struggle for Justice (Pilgrim Press, 1995). As a United Church of Christ pastor, she served three congregations: two in Michigan and one in the Netherlands. She currently lives and works in Okemos, Michigan. Julia Watts Belser is a rabbi, scholar, activist, and educator passionate about the intersection of religion and social change. She is a Visiting Assistant Professor of Women’s Studies and Jewish Ethics at Harvard Divinity School, as well as an Assistant Professor of Judaism in the Religious Studies department at Missouri State University. She co-authored A Health Handbook for Women with Disabilities (Hesperian Foundation), to help women around the world advocate for better health and stronger communities. A training partner with Allies for Change, she engages LGBT issues, disability rights, and racial justice work. Her current scholarly research sets feminist environmental ethics in conversation with classical Jewish texts on natural and political disaster. She received rabbinic ordination from the Academy for Jewish Religion, California and her Ph.D. in Jewish Studies from U.C. Berkeley and the Graduate Theological Union. 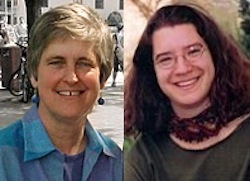 Join us on Wednesday, May 16th, 2012, at 1pm (EDT) to talk with Melanie and Julia about their article and their work in feminist theology. To register, email the words “register me” to waterstaff@waterwomensalliance.org by May 15th, and you will receive dial-in info.